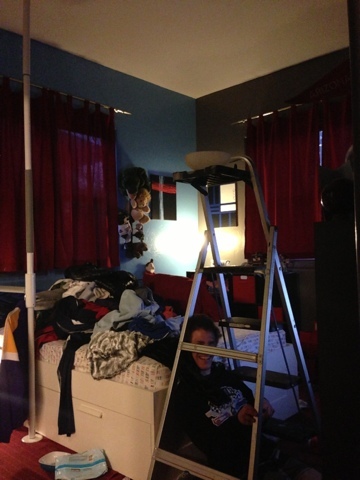 Of course, one week from move date and the light bulb in Mik's room finally went out. 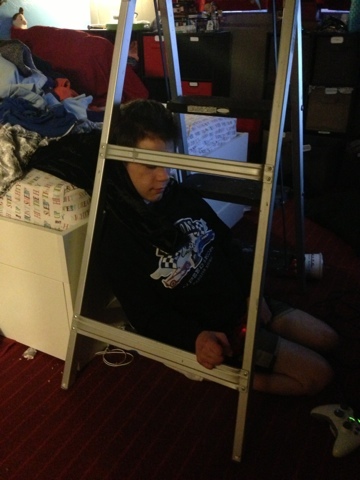 Mik is now sure wishing the move date didn't get moved back a week, as he had to put up with Dad coming in after waiting two nights of no real light in his room and putting the ladder right over him to change the bulb. He asked Mik to move, but only gave him five seconds, which wasn't even enough time for him to stop leaning against the bed. Quite uncomfortable fifteen minutes of waiting for Dad to then go search out a fresh lightbulb, but at least it is changed. 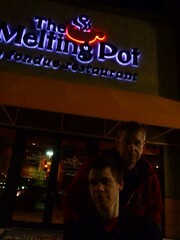 When I "graduated" from high school in 2004 we went to The Melting Pot. 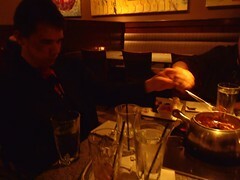 Then in 2007 we celebrated my Bachelor degree graduation at The Melting Pot. Mik graduated from high school in December and last night we finally got around to going to The Melting Pot to celebrate (it took so long to get around to it because of Mom and Dad going to Chicago for Christmas and then having several days of parties and get togethers this past week with their getting remarried on January 1st and having a bunch of family and friends in town). Unlike most times we have done the Melting Pot, this time we stuck to just the cheese and chocolate. It was also the first time we had gone as just the four of us and it was kind of odd to only have one pot at the table. Thus, we had two cheese courses to be able to try to different cheeses. Then for dessert we had the Cookies and Cream Marshmallow Dream.